HMH Books for Young Readers, 9780544582415, 80pp. It's late April in Barrow, Alaska, which is about as far north in Alaska as you can get. The call comes in over the two-way radio - a crew has caught the first whale of the spring whaling season. Men, women, and teenagers jump on snow machines and drive out onto the ice to help harvest the whale, a tradition the Inupiaq Eskimos on Alaska's North Slope have followed for over two thousand years. John Craighead George, or Craig as he's called, heads out too. He is an Arctic whale scientist, and out on the ice with the whales and the whalers is just one of the places where an Arctic whale scientist works. He and his colleagues have an agreement with the Inupiat to study these whales, bowheads. He has studied them for nearly thirty years and the mysteries of these large creatures never fail to amaze him. This installment in the Scientists in the Field series takes readers along with Craig, his wife, their colleages, and the Inupiat people as they go out on the ice and harvest whales. Lourie also details the happenings in Craig's ramshackle lab where he studies various organs and body parts, takes careful measurements, and crunches numbers. This is a real profile of what it is like to be a scientist living where he works, harvesting his own subjects, and using information passed down from generations of Eskimo culture to help him as he becomes the world's leading expert on bowhead whales. Craig George is the son of legendary children's author Jean Craighead George, and it is easy to see that Craig grew up in a household where nature and human interaction went hand in hand. 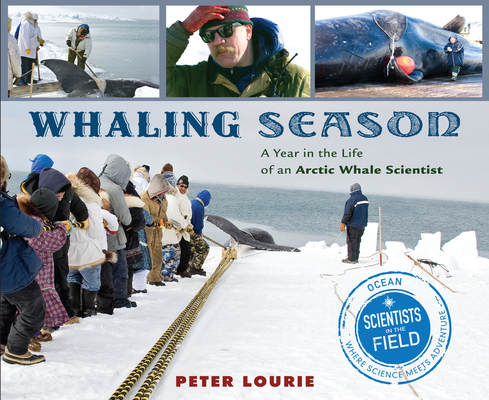 Author Pete Lourie's stunning photographs will transport readers to the top of the world, where the days and nights are long, the people respectful, and the whales are at the center of it all.